This is mostly a bloated, highly undistinguished bit of mythmaking, stuffed to the gills with clichéd characters and motivations, says Raja Sen.
We, however, expect more from fascinating filmmakers like Duncan Jones than literally delivering what is promised on the label -- and not even doing that memorably enough. Sure, this is a loud movie with giant battle sequences and much swordplay, and the production design is significantly trippy. Yet this is mostly a bloated, highly undistinguished bit of mythmaking, stuffed to the gills with clichéd characters and motivations. There is some sharpness in the way a few action moments are choreographed, but overall this is a lacklustre enterprise, tragically lacking in wit. There are orcs -- hulking creatures with fangs that grow unattractively upwards from their lower teeth -- and there are humans, and both these sides battle it out through giant portals. That's basically it, and while I'm certain gamers obsessed with Warcraft will bring much backstory into this experience, those of us who don't play this particular title really have no business being here. We're not worthy, thank god. The first problem is one of inscrutability. Jones valiantly hits the ground running, showing us, in quick succession: a pregnant Orc, an Orc-baby who has the soul of a deer fed to him, a human King who looks like an uncharismatic Kenneth Branagh… and so on. Dozens of tongue-challenging names are bandied about -- names with apostrophes where vowels should be -- and most of them come to us by way of deep, digitally altered voices. Visually, the film does create another world and the attention to detail is lavish and immersive, but this is 2016 and we need more than mere costuming and spectacle. Scale cannot define a giant film like this anymore, and while it's all very well to have elaborately-upholstered wolves and impractically grandiose armour, the set-pieces seem disappointingly generic. I felt at times as if I was watching a giant film made in Telugu, for example, and dubbed into English: so wooden were the lines and so familiar the mythic tropes. There are good dads and helpless sons, for example, on both ends of the portal, and babies set afloat in rivers and sent to their survival. We've seen it all before, and, truth be told, we've had it all told to us more engagingly. It is an efficiently made film, certainly, but there is no panache to render it interesting. Save for Paula Patton's green-skinned half-Orc, the characters are painfully bland and the actors playing them dull. There are a couple of action moments that stun -- one involving an attack by a shield formation is particularly nifty -- but a good minute or three does not an entertainer make. It doesn't even seem compellingly video-gamey, which is most tragic. There is a fine scene involving dropping a heavy character onto another, but even that genuinely clever flourish is lost as the film drags interminably on. I'm a massive admirer of Jones's work, and loved both his previous films, Moon and Source Code. 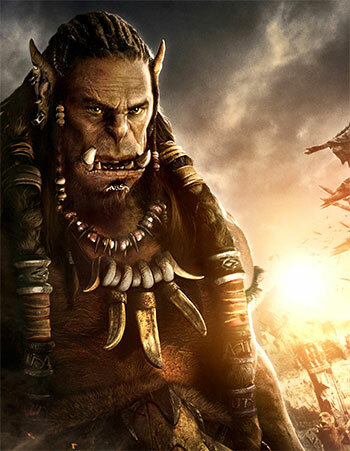 Warcraft is, on every level, a disappointment, especially since you see what he's trying to do -- the kind of man-woman parity he's aiming for, mostly unseen in a film of this scale -- but then you see, frustratingly enough, that the film itself is a mediocre casing for any grand idea or deft nuance. It's mostly swallowed up by badly mumbled gibberish, like the villain in the climax chanting what sounds (a lot) like saying Eddie Izzard's name over and over again. There is but one moment of brilliance, and this I mean literally: it is when a Guardian wizard burns up a young apprentice's magical research, a visually arresting shot that holds the promise of Fahrenheit 451 intensity. It boils over, alas, in but a second, the rest of the film unfit to fry an egg.